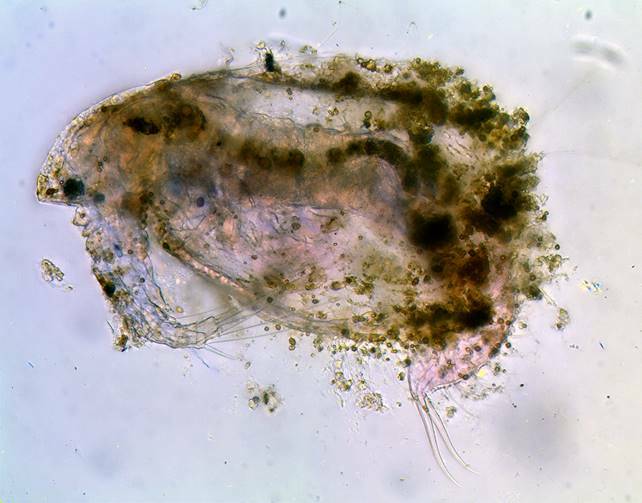 The Cladocera are what are more commonly (and inaccurately) termed ‘water fleas’. A large and diverse class with over 700 known species, they are predominantly freshwater organisms found in almost all areas of the world. 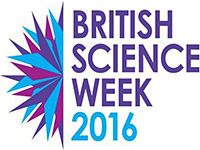 Within the UK there are over 80 species to look for, which gives plenty of interest every time a new pond, lake or stream is sampled. Even a well-known site may yield different species at different times of the year. Although a few species are very small, most are large enough to see in a sample-tube with a hand lens. Ideally, a net with a mesh finer than 1 mm should be used (I use 135 µm) to ensure that the smaller specimens are caught. 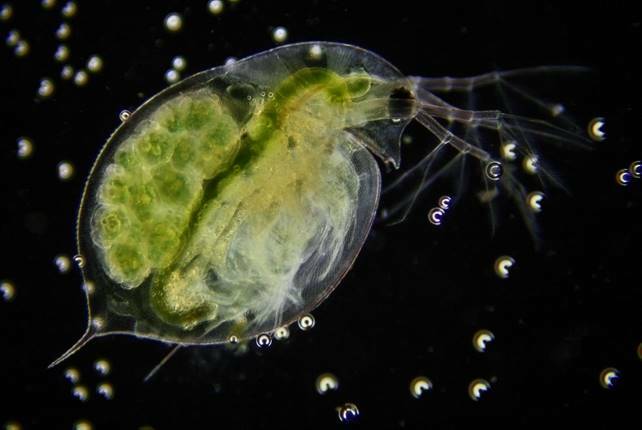 Daphnia species are likely to be found almost anywhere, sometimes in staggering numbers. On some of the Quekett excursions to places such as Queensmere on Wimbledon Common, the numbers are so large that they mask underlying smaller populations of other cladocerans. In such a case it requires patience and a steady hand to sort through a sample under the stereomicroscope to reveal the less common specimens such as Leydigia leydigi. It’s interesting to compare specimens taken in different parts of the country, as local conditions may give rise to surprising changes in appearance. 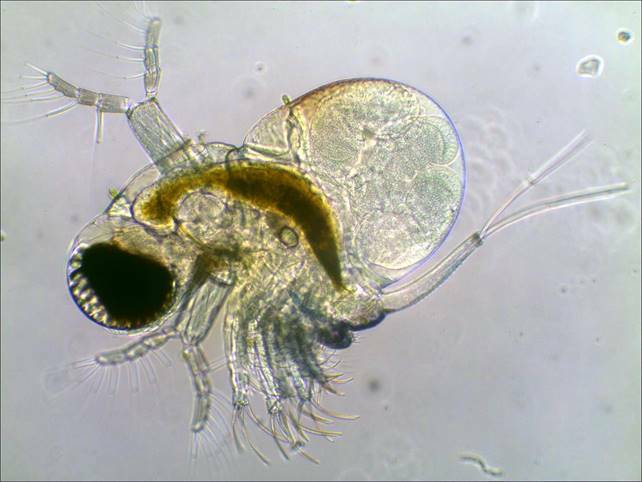 Whilst most cladocerans feed on micro algae, a few are predators. One such is Polyphemus pediculus, easily recognised with its huge single eye. Females predominate in all the species and reproduction is parthenogenic for most of the year. Apart from one species (Leptodora) there is no larval stage, and young are released from the brood-pouch as miniature adults. Infrequently, males appear, and sexual reproduction takes place. This is usually at times of drought or the onset of extreme conditions, when the females will produce what are termed ‘resting’, or sometimes ‘winter’ eggs. These show up as a dark saddle-shaped ephippium, which usually falls to the bottom. In this form, the eggs can withstand considerable drought and remain viable for years. The males are quite few in number and often difficult to recognise. In some species males are, so far, unknown, and have only been artificially created in the lab by hormone treatment. I try to identify as many as I can, as pictures are few and far between and the literature is rather deficient on the subject. 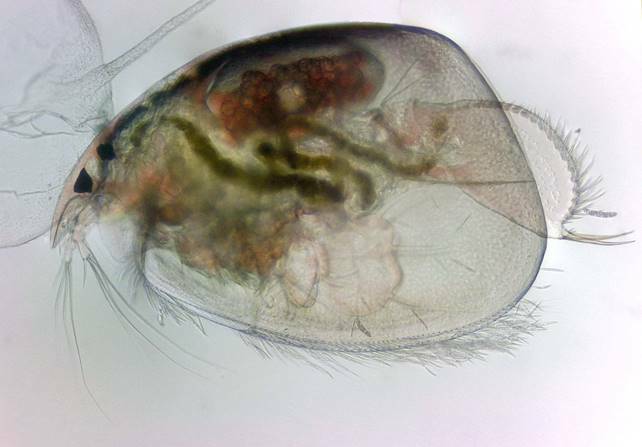 This is a composite image of two specimens of Bosmina longirostris from the same wet mount which show quite different morphological traits. I took two pictures at the same magnification and placed them together for comparison. The one on the right is obviously female, as shown by the eggs in the brood-pouch. 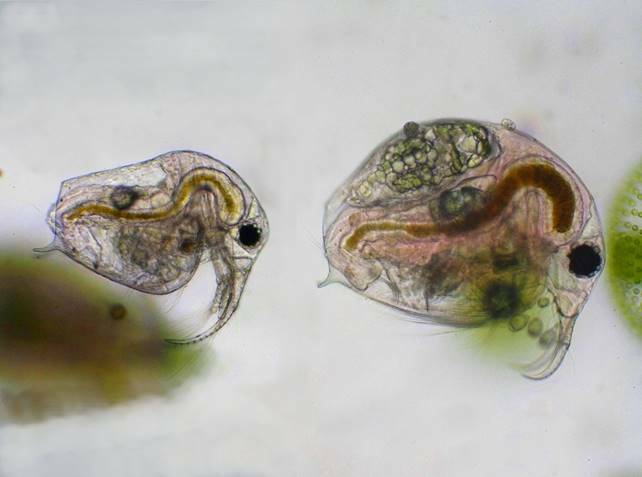 After showing this to my friends at the Cladocera Interest Group we decided that the one on the left must be a male. 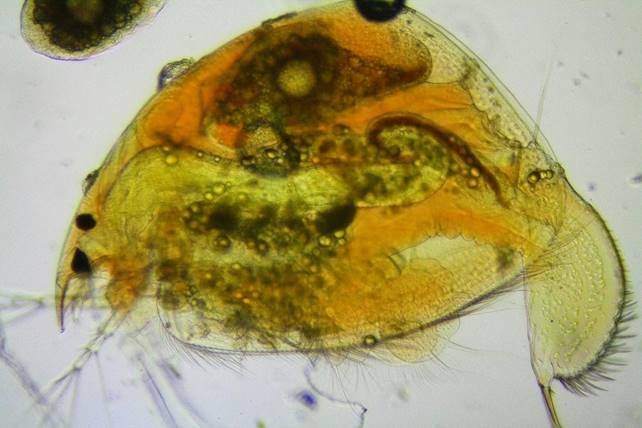 Cladocera make good permanent mounts and I usually try and make slides from each location that I sample. It’s important to label such slides properly, as an unlabelled specimen is worthless for further research. A unique ID number and location is the minimum. This can be linked to a database or spreadsheet with much more information that can be built up as the specimen is examined over weeks or years later. Species identification can often take some time, and it’s quite common for a slide to have dozens of specimens to view. Some may seem insignificant, but it’s always worth a look at what might just be a bit of debris. This specimen of Ilyocryptus sordidus was tucked away unnoticed in the corner of a slide made after a Quekett excursion to the Basingstoke Canal at Brookwood. It may look like a pile of detritus, but that’s the way it lives.